Montecito is fantastic, and it was really the most elegant one, with fountains and everything. It was also the most expensive. Everything was OK, and the rooms were fine. The staff who accommodated us was good and attentive. Based on everything that I have gathered and all the other places I have seen, they're over-priced. The people that I have interacted with were friendly and nice. The people at Montecito were very nice, but the décor was a bit dated. The place was gigantic and felt a little dirty. They had a pool with a lift for people who could not go down, which I thought was nice. They had a workout room, a restaurant, a café, a social hall, and a game room. Montecito is excellent, I definitely loved it, and it was great. It was clean, the staff was friendly and eager to help, and it looked like it had a lot of amenities for the residents. However, it was very expensive. Montecito was a new, nice, clean, and pleasant place with good food and good service. The staff was very pleasant. I really liked Montecito. I went there on a whim. It was nice and clean, and everyone was pleasant. We had lunch, and the food was good. I liked the pool that they had and everything just seemed like it would fit my needs. The staff was very nice. Montecito Oakmont was not attainable for me since the cost was too high. I liked the whole environment because it seemed very comfortable. I was very impressed. The staff was very nice, friendly and helpful. I liked the layout and the open areas where you could mingle with people. We were very interested in Montecito Oakmont. There was nothing we did not like about the place. They had very comprehensive and genuine care, a very up-to-date facility, a great deal of scheduled activities, and a lot of amenities. The living quarters and dining room were beautiful. It is a very large place with very long hallways. It was laid out really well. It looked more like a hotel resort with its center courtyard, pool, and jacuzzi than a typical senior living facility. My mom was at Montecito Oakmont. The residents were extremely happy, energized, and well taken care of. The staff was very positive and very friendly, and the wait staff was excellent. A five star rating applies to everything there, except maybe for the price. We paid quite a bit more for it; probably twice as much as what we’re paying here in Texas. I am in Oakmont at Montecito (Montecito Oakmont Senior Living). I like that everything is done for me. I have a beautiful 2-bedroom apartment with an outdoor patio. I have 3 meals a day here. We have a dining room where I can meet other people. There is a very social atmosphere here. We are having a pianist that will come at 3 o'clock today to play the piano for an hour for the community. It is very nice that we always have some kind of a musical concert once a week. Everyday, we have card games, bingo, or scrabble. Everyday there are activities for the residents here. We have a bus that takes us to doctor's appointments and grocery shopping. They do my laundry. The staff is wonderful. I consider everybody here family. All of the girls that help me treat me like I am their mother. They love me here. I highly recommend it. The food is excellent. We have a 5 star chef in our dining room. We are very secure. We have gates all around the facility. We are on lock down after 9:30 at night, and nobody can come in unless you live here, and then you have to go to the front desk. It is safe here. I live with my little dog in the apartment. I have lived here for 2 months, and we haven't had any problems so far. We have a heated swimming pool, a hot tub, a Jacuzzi, and a walk-in bathtub. We have a nurse on staff here. Oakmont is congenial and it has wonderful assistance. My husband and I are in the assisted living, so we do have some amenities that they don't have in independent living. They also have something they call Tradition, which is almost separate. It has every level of care you want. Mom lived in Oakmont, but she passed away last week. We're very, very happy with Montecito. One of her friends was already living there. They're very, very cordial, very caring, and got to know the residents. We chose the facility because of the proximity to where we lived. It's beautiful, has wonderful food and caring staff, and is just top-notch all around, we felt. They offered different kinds of rooms, from independent to assisted to memory care, so we liked the fact that there were options. She could move as she needed, which she did wind up doing. We thought the rooms were lovely -- simple, but big enough. We only have good things to say. I live in Montecito, and it's really nice here. It's a living community, and you may go with assisted living for quite a few more dollars. I don't like it here. The main reason is it is so far away from my family and friends. I was in San Francisco for the last 35 years, and people don't want to drive this far to see me. It seems that when I was in the city, I had constant people coming, and here, I'm very lonely. It's my only complaint because the people here are very nice. The grounds are beautiful, they keep them up, and I've made some friends. It's a 1-bedroom, and it has a little kitchen and one little bathroom. It has a fair-sized bedroom and a fair-sized living room. It's clean and it's OK. The food is fair, but I am a gourmet cook, so I can't appreciate it like other people do. I know that they work hard, and they do have a varied menu. They have something going on all the time: cards, other games, movies. They have a bus and a person who will take you some places once in a while. I am very pleased with Oakmont. The facility itself is immaculate and very clean. The staff is very sweet. The people are very friendly. The food is good. There are a lot of activities. I have nothing bad to say about it. They have everything that I want. After my grand father passed, our family thought it best to have grandma live in a facility. The staff is amazing! We live outside of California, but I am in contact with this facility at least once a week. While visiting, I see the interaction between the staff and residents. The staff is always helpful and seems to genuinely care. There is an inhouse cafeteria and the food is ALOT better than I expected. Beer and wine is served for residents. Montecito was beautiful and very nice. It was like a hotel, but it was too expensive. It didn't fit our budget. We sat with the director and she was good and very direct. The rooms were outstanding and beautiful. We met the greeting staff and the activities director; they were very engaging. Montecito is a fine community. If I have to rate any of the places where I would put my mother, Montecito would be my first choice. I like the activities that they have for the residents and I like the person who gave me the tour. She was very nice and helpful. She answered my questions, but wasn't giving me a sales job. She gave me more information, which was above and beyond what she needed to do. It was certainly helpful to me. Montecito was fine and looked nice. I was pleased. I certainly would consider it when the time comes. They provided activities and was all-inclusive. The dining area at Montecito was very nice. I was impressed with it. The place was clean, nice, and organized. It was one of my favorites. Montecito is a very nice community, but very expensive. The place was very clean and the staff that I met was fine. The residents looked happy as well. They have a nice pool. I liked Montecito. It was very nice but a little more expensive than the other facility I visited. I formed a very good impression as soon as I walked in. I thought Montecito was very good. It's in a quiet community in a walkable area. It is in a safe community probably for sure. I thought the food was pretty good. The rooms and apartment were small. Montecito is the best one. They have a huge movie theater as well. It is probably the most expensive as well too. It is a very big place, and it was newish at the time we visited. Features Extra: Library, Fitness Room/Gym, W/D In Apt. Oakmont of Montecito is a lovely retirement community situated on a lush campus with lovely views and a variety of engaging activities. We are also very close to shopping, fine dining, and entertainment. If an active lifestyle is what you desire, you’ll feel at home in our retirement community where friends and neighbors enjoy our spa, private movie theater, swimming pool, and lovely grounds. If you ever need additional care, we offer assisted living and memory care services right within our community. Experience for yourself what makes this extraordinary senior living community one where life keeps getting better. 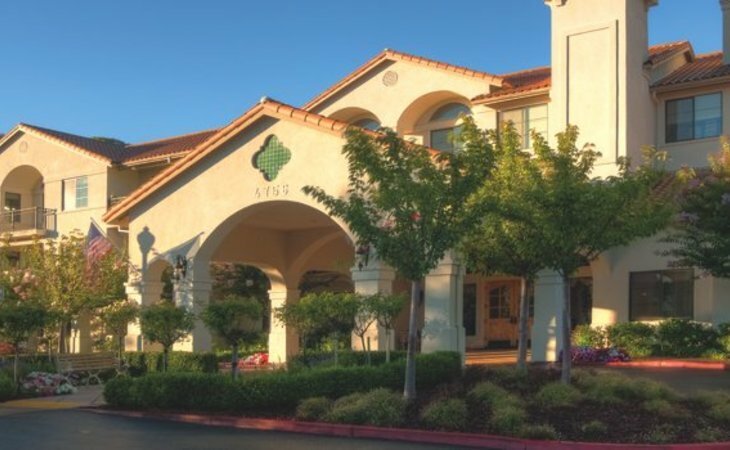 What should caregivers and potential residents know about Oakmont of Montecito?